The population of the Southern Rockhopper Penguin around South America has experienced variable trends over recent decades (1). Their breeding pair numbers on the Falkland Islands have declined dramatically, falling by more than 80% since the early 1930s (2), but there are indications for a stabilising trend, although numbers are still fluctuating extensively (3, 4). Comparative investigations into the ecology of Rockhoppers from the Falkalnds and from Staten Island, Argentina, have shown that the two populations differ in their diving behaviour (5) and their foraging areas during austral summer (6) and, in particular, over the winter period (7, 8, 9). Apparently, Rockhoppers can also adapt their foraing behaviour according to the local environmental conditions, which could be confirmed in a multi-year study in Berkeley Sound, Falkland Islands. The diving behaviour of Rockhoppers from Isla Noir in Chile differed as well, indicating the potential for adaptations to the respective environments (10). 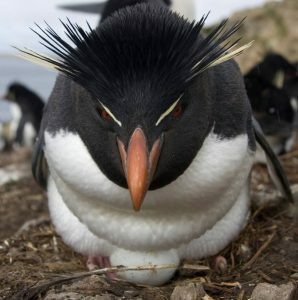 This research has indicated that especially Rockhoppers from the Falklands are increasingly threatened by human activities such as fishing and oil exploration and exploitation (11).